We do get it! We got it a couple of years ago when tire prep got banned. We quit using it. The people that don't get it are the ones that still use it! Take my tires, any of them, all of them! They will be clean, and have been clean! The game is up. Quit complaining and crying foul! If it is on the track it is in your tires!! You're wrong. There is NO WAY I can get enough prep into my tires to change the chemical makeup just from following your tires around the track. Anyone that knows about prep knows it takes DAYS of work and rolling and wrapping and re-coating to get the prep IN the tire. We aren't talking about the "topical" preps that make the tires sticky for 2 laps. LISTEN..........the tires that were tested and found ILLEGAL showed a different CHEMICAL MAKEUP than the baseline tire, and the 4 or 5 that tested LEGAL. You guys are going to have to get over this! Your speed "secret" got found out. Like most of us didn't know anyway. The party is over. Go to work and get fast legally. NO sorry I am RIGHT ! It has and will happen again with this (my little johnny got beat) testing. 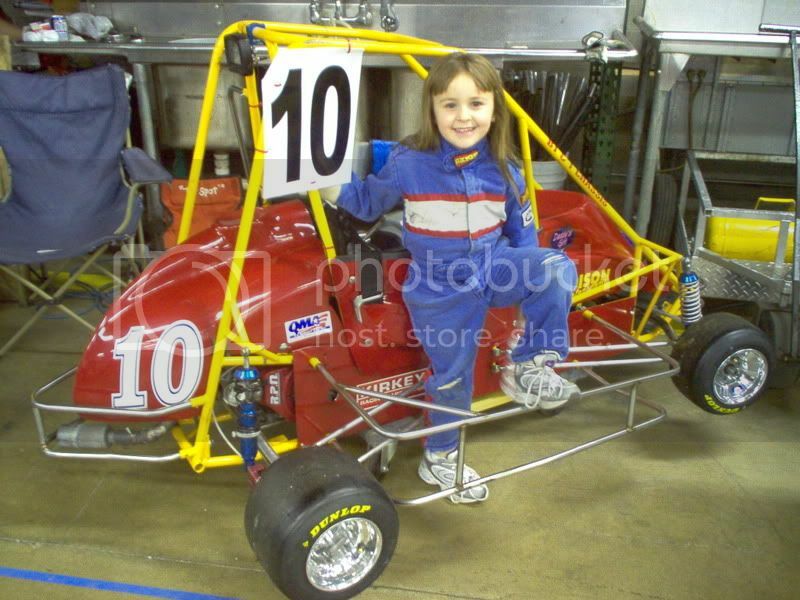 GO USAC........ Come to North Carolina ......PLEASE!! Well fact is USAC will not tolerate tire treatment either so best cheaters be aware. I am sure they will be on the look out guess Tampa will be the first race to see if anyone tries then yells foul. Then on to Ohio so we will see. Tire prep is tire prep no matter how you do it. Chemicals are chemicals and tests are tests. well phaster, your doing the same thing, your quote "hiding behind" a screen name too. no, brt or whoever u really r u need to get over this. my speed "secret" is my kid. u seem to know alot of the facts were u in the room with DP? this topic has been looked at almost 4500 times. you guys vote usac, get rid of the politics, get your cars ready, race. its simple!! d-train you put something on your post that might make people think you used prep.You said "if it's on the track it's in your tires" tire prep just doesn't go in your tires YOU have to put it there. Now someone in reg4 got busted and he deserves it.He puts it on/in and also puts stuff in his gas that will make your eyes burn.He is a CHEATER period.That's why he doesn't want usac because it's not no 30 day tech it's one year pack your stuff and you have one year to explain to your kid that you don't have a clue how to get the car to handle.Usac please erase this post the people that got busted there 30 days should be up. Yes LLR we have used prep in the past, as have you ! Yes you will pick up anything that is on the track,you dont have to soak it or wrap it or take two weeks to make it work. All I am saying is if a tire is ran on a track the chemical of that tire has changed from that as in a new tire (which is their "test" tire).You have to compare to a known not preped tire that has ran in that race! If a tire is ran on a track that has prep on the track from another car,60 to 70% of the tires will come back ilegal. Have anyone talked to a prep company? Quite frankly I am getting a little tired of these excuses for being charged with illegal tire prep. If the handling of the taken tires was not done correctly then that is another issue. First of all the amount of time necessary to completely prep the tire is more that any racer would come in contact with the tire prep on the ground. Thus the inside of the tire would not show the prep coming through. That is common sense. Secondly, because you care less about the chemical and the safety do not assume that EVERYONE has or is using tire prep. There are many handlers that would much rather keep their drivers safe and spend the money on the many tires required to run multiple races. This includes LLR whom you are so sure he has used tire prep. Think again! Third, try prepping the tires and run USAC I dare you! I've got a question!!! I've never used tire prep but with everything going on I thought I should ask!!! OK I don't have a lot of money so when I buy a set of tires we run them until the seams are showing and I mean showing!!! So when that happens sometimes I have to use fix a flat to keep air in them. So my question is that legal or not since it a chemical. I would believe that fix a flat would not be recommended to use. They say to only use water, mild detergent, tire snot etc to mount tires and water and mild detergent to clean the outside of them for the dirt racers. I would not recommend putting anything but air or nitrogen inside your tires. And if the cords are showing, I would suggest not racing on them to prevent an accident should it blow out during a race which could injure not only your driver but put other drivers and spectators in harms way. d-train your totally wrong about me I have never used tire prep in my life I love my kids too much. take your 30 days and shut up about it.It should be about over.I will tell you the same thing I told another guy I will give you all my tires you pay to test them and if they have stuff on them or in them I'll pay it...You better have a big check book I have alot of tires from last year and there's alot of people on here that know me and will tell you I buy alot of tires.NOT tire prep. I didnt know I was talking to one all mighty! My stuff wasnt taken so you are wrong there. Guess this sport will never learn with bone heads in charge! !